The Pink Box has been involved in and has co-ordinated numerous street Party Events since 2005. Jointly & individually – in Pride Street Fair, Mask New Year’s Eve, Cobern St Fair & Spring Fair & The White Party. Most hosted in the Streets of De Waterkant Village, offering a variety of Arts & Craft stalls, Food Kiosks, Live Entertainment, Local & International DJ’s, Welcome drinks, Loads of Freebies and Give-aways. All of the above were Gay & Gay Friendly events, However The Pink Box also facilitates a number of Generic events. Each event has a charity beneficiary. These events are supported by a large cross-section of the Gay community and as such, offer the corporates a unique opportunity to introduce or re-enforce their branding to this lucrative & affluent Target Market. The objective of the party is to celebrate the coming of the Cape Town Summer season and appeals to the mainstream and alternative sectors of the Gay Community. Not much is happening on the Pink Calendar of Cape Town over this period and as such The Cobern Street Spring Fair completes the calendar with a very welcome event. 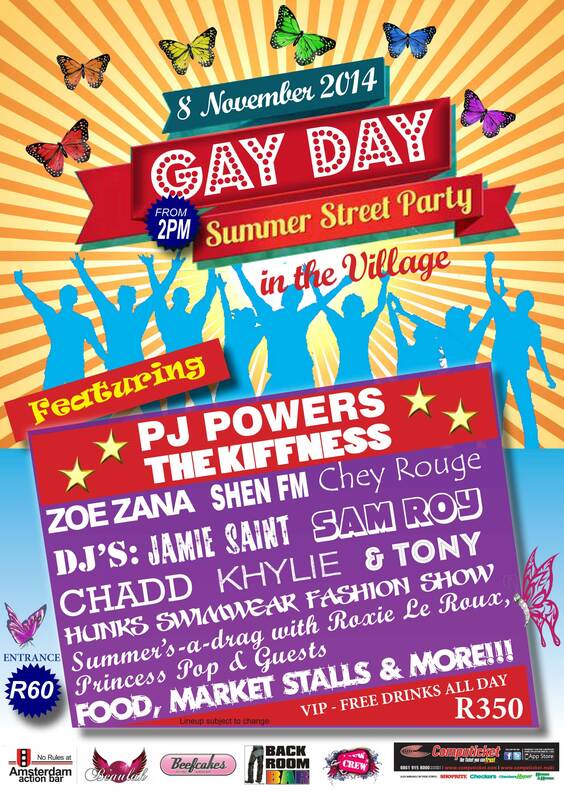 Also a Street Party, the format is very similar to the Cape Town Pride Street Fair. A traditional closing off of the year, the NY’s Eve White Party is hosted at a time when Cape Town is visited by a magnitude of Pink visitors, nationals as well as internationals. It is also an event that is well supported by the Local Cape Town Community at large. Being a Night time event the streets are transformed into a Fairt Wonderland and more attention is giving to Décor, performers & music. This event is the largest & most popular Gay Event on the Pink Calendar !! The CT Pride Parade culminates in the streets of Napier, Liddle & Cobern for an afternoon of fun !! Party goers are treated to variety of Stalls, Great Music, Fabulous Entertainers & Artists and 6 bars to choose from !! This ensures that no one leaves around 8 and can say that they have not had the time of their lives !! As a 1st, Pink Box is introducing a VIP section to the Pride 2014 Street Party and will most probably do the same for 2015! This is a all inclusive Free Drinks option for the more discerning party-goer ! !